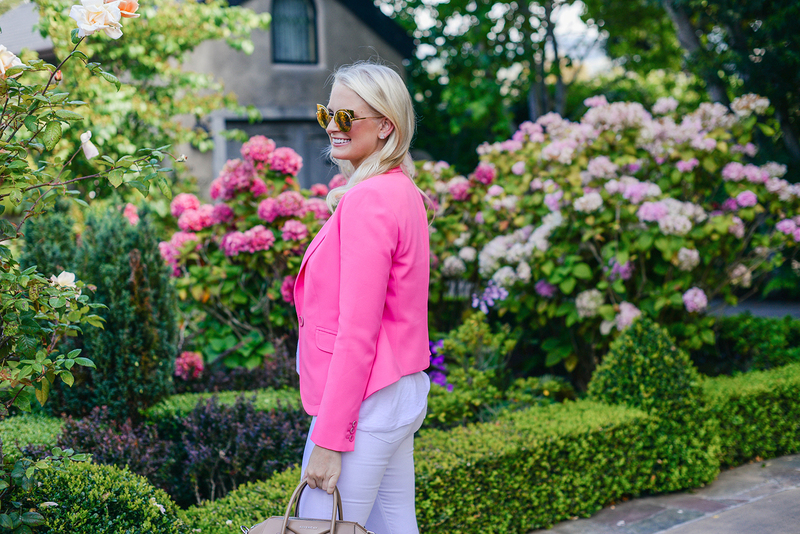 You probably think I’m crazy for pairing so many statements in one outfit, but I LOVE IT! If you were to ask me the one color I never really wear, I’d probably say pink. I have plenty of blush in my closet, but absolutely zero hot pink. It wasn’t until a few years ago I warmed up to the idea, but I used to never buy it. I actually used to hate it, if you can believe that! I’m still not a fan of all shades, but this vibrant hue totally caught my eye while I was swimsuit shopping at Trina Turk a few weeks ago. 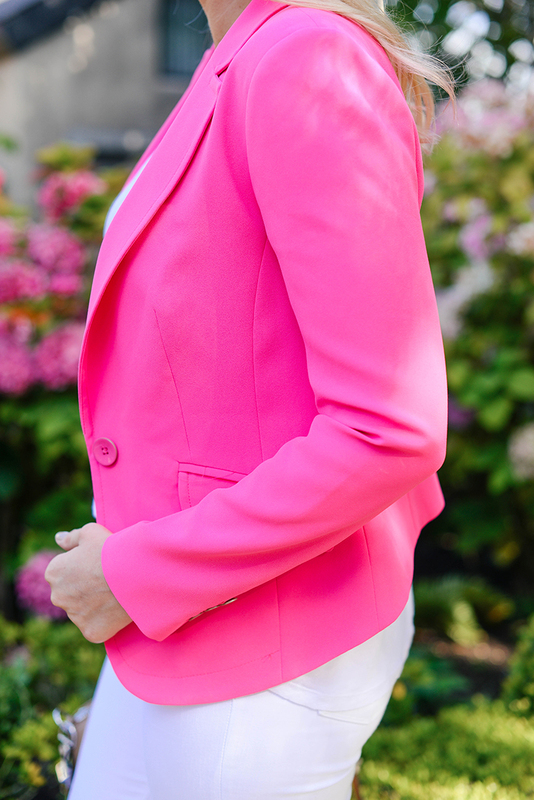 Y’all know how much I love a tailored blazer, and I thought this fun shade might lighten up such a polished piece. And how about these sandals?! I’m obsessed! They were the perfect birthday present from me to me, don’t you think? Since it’s kind of difficult to sport heels in Carmel, a fabulous flat shoe is just what the doctor ordered. Speaking of Carmel, have you been following the Soberanes Fire in Northern California? My mom is there right now and has been sending me updates regarding evacuations and such in the area. It’s so scary! Thinking about everyone effected by these wildfires. 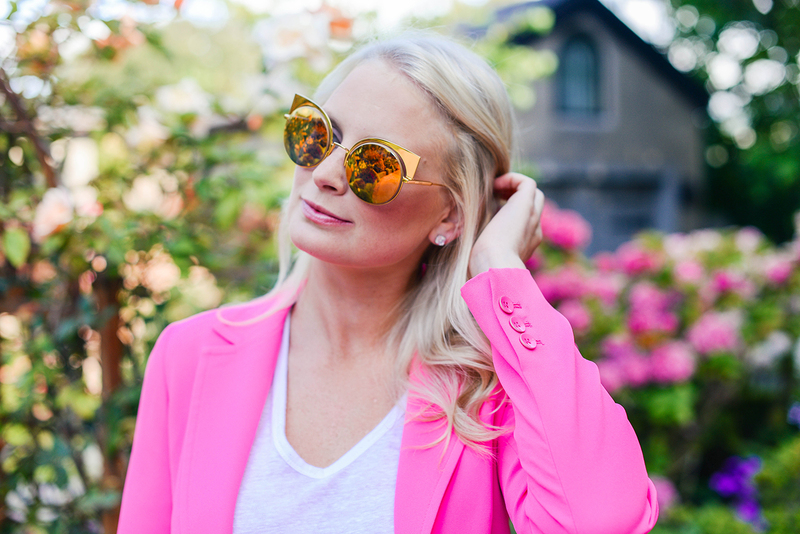 Ending on a happy note this Friday… I borrowed these amazing sunnies from my sister for this shoot, but decided I needed to get a pair for myself! They just arrived in the mail. YAY! Hope you all enjoy your weekend! These sunglasses are so fabulous, I wish I could justify getting another pair. Merritt! 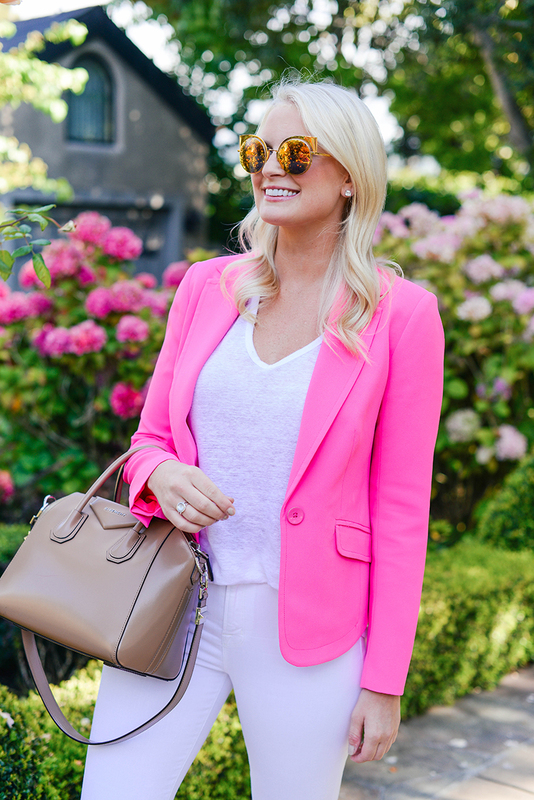 This is just too good – I love, love, love how you styled this look! Have a great weekend! I LOVE all the statements in this outfit- not crazy at all! Beautiful hues of pink, gal! I love this together!! Wow! The hot pink looks so good on you! Lovely shoes! I Love the details!